Louise & Tamara will perform a selection of popular operatic, classical and music theatre pieces – a ‘highlights’ concert, to welcome you into our 2015 Season. Tamara-Anna Cislowska is one of Australia’s most acclaimed and recognised pianists. She has performed across five continents in repertoire spanning three centuries, from Scarlatti to Sculthorpe, to consistent critical and public acclaim. 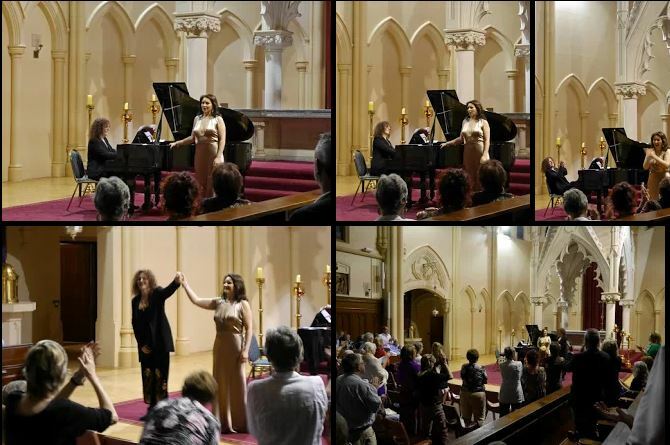 Tamara has won international prizes in London, Italy and Greece, including the Rovere d’Oro, and in Australia was the youngest pianist to win ABC Young Performer of the Year at age 14. She is a recipient of the prestigious Freedman Fellowship (2003) from the Music Council of Australia, a 2012 Art Music Award for ‘Performance of the Year’ (ACT) and nominated for a 2014 AIR Independent Music Award. Tamara is a regular guest of orchestras and festivals worldwide, including as soloist with the London Philharmonic Orchestra, the New Zealand Symphony, Auckland Philharmonia and all the Australian Symphony Orchestras with conductors such as Werner Andreas Albert, Matthias Bamert, Asher Fisch, Johannes Fritzsch, Christopher Hogwood, James Judd, Markus Stenz, Yaron Traub, Edo de Waart, and Marco Zuccarini. She has toured with the Australian Chamber Orchestra and as a recitalist she has performed at the Purcell Room in London, Kleine Zaal of the Concertgebouw in Amsterdam, the Frick Collection in New York, and the Utzon Room at Sydney Opera House. Tamara is a regular guest of orchestras and festivals worldwide, including as soloist with the London Philharmonic Orchestra, the New Zealand Symphony, Auckland Philharmonia and all the Australian Symphony Orchestras. As a recitalist she has performed at London’s Purcell Room, Amsterdam’s Kleine Zaal of the Concertgebouw, New York’s Frick Collection, and at Melbourne Recital Centre. 2015 highlights include concerts for Sydney Opera House, Melbourne Recital Centre, Australian Festival of Chamber Music, ABC Classic FM, with Adelaide’s Soundstream Collective and Sydney’s Acacia Quartet. The first Australian to be accepted into the Young Artist Program at the Opéra National de Paris, mezzo soprano Louise Callinan is also the winner of the prestigious AROP prize of Opéra National de Paris. She has sung with BBC Symphony, Chicago Symphony, l’Orchestre National d’Ile de France, Théâtre du Châtelet, LA Opera, Staatsoper Unter den Linden, Opera Australia, Israeli Opera, Opéra de Rennes, Angers Nantes Opéra and Theatre de l’Opera Luxembourg. She began her career with roles such as Angelina (La Cenerentola), Rosina (Il Barbiere di Siviglia), Dorabella (Cosi fan Tutte) and has interpreted numerous roles at Opéra National de Paris, notably Meg Page (Falstaff ) conducted by Conlon. Louise sang the 2nd lady in the film version of ‘The Magic Flute’ directed by Kenneth Branagh. Louise has now moved into the dramatic mezzo repertoire and has performed Tigrana (Edgar) and Dalila (Samson et Dalila) in Valladolid, Erda (Das Rheingold) and (Siegfried) and Waltraute (Götterdämmerung) with REMIX ensemble under the direction of Peter Rundel at the Casa da Musica in Porto, Strasbourg — Palais des Fêtes, Paris — Cité de la Musique, Théâtre de Nîmes, Théâtre de Caen, Théâtre de Saint-Quentin-en-Yvelines, Grand Théâtre de Reims, Grand Théâtre de Luxembourg, Amneris (Aïda) at Opera Bélarus Minsk, Herodiade (Herodiade – Massenet) in Valladolid. Louise’s most recent projects included Laura Adorno (La Gioconda) in Valladolid and Rossweisse (Die Walküre), Wellgunde (Das Rheingold and Götterdämmerung) second lady (Die Zauberflöte) at Opéra National de Paris conducted by Philippe Jordan and Das Lied von der Erde with Remix Ensemble Casa da Música, Porto conducted by Peter Rundel. CLICK HERE for Concert 2 Programme – cover + biographies. CLICK HERE for Concert 2 Programme – repertoire.